Margaret Atwood and I made up. The quibble was rather one-sided, and Ms. Atwood has no idea we were not on best terms. The problem was all mine. I avoided her writing for years. You see, I went to University of Toronto, our mutual alma mater, and Margaret Atwood followed me everywhere. Her name was mentioned in every speech given at any official function, her face stared me from lamp posts. And so I stubbornly refused to read anything by her. Yes, even her sci-fi books. The resolution only grew stronger after the review by Ursula Le Guin of Year of the Flood, in which Le Guin took issue with Atwood’s avoidance of the term ‘science fiction’ to describe her work. Then I read Oryx and Crake because somebody whose taste I trust implicitly put it in my hands and told me to read it. And it was amazing. Thus I broke my running streak of avoiding books by Atwood. After reading Oryx and Crake and realizing that this geas was incredibly petty, I picked up her collection of writings about SF. ‘SF’, by the way, is intentional, I think. In the introduction, Atwood talks about Le Guin’s review and how this falling-out between her and the SF community was based on a technicality and quirks of genre labeling. In Other Worlds has three parts, the first being essays on the genre in general, second containing a few book reviews and essays about classics like Brave New World, and the third being a compilation of very short stories, each exploring some trope or sci-fi technology like cryogenics. I found myself liking the Atwood in the book. I liked her voracious reading, which was similar to my own, and full of both literary and pulpy stuff. I loved her writing style and her sense of humor. She is definitely a master when it comes to phrasing. Her essays on the history of the genre and its cultural role are very astute and quite worth the read. And yet… and yet I feel that I still have beef with Margaret Atwood. It might be the tone — occasionally I cannot help but think that she is making fun of the genre she purports to love, or making fun of people who are serious genre readers. I don’t want to get into ‘nobody understands us’ teen-like geek angst, but I feel like we’ve had these ‘is this sci-fi’ discussions so many times before that they are not useful anymore (‘is this sci-fi’ is now a running joke in my bookgroup — someone inevitably yells it out Freebird-style during any meeting that involves a book that is a little bit, let’s say, genre-bending). I also think the geekdom decided a while ago that multi-limbed aliens and purple squids from space are not what makes sci-fi actually sci-fi, and bringing up those or any reference to ‘gizmos’ up when classifying sci-fi is a mark of being somewhat behind on the discussion. My other problem with the book is purely structural: mixing fiction and non-fiction in one collection just doesn’t work for me. As I read, I kept wishing that the entire book contained essays and reviews. I did not think that all parts of the book formed a coherent whole. 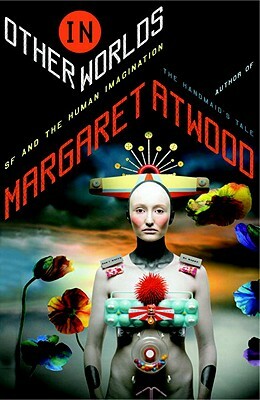 I also have to say that the publisher did Atwood a disservice by picking a cover that is both quite ugly and contains all the elements that are likely to repel readers who do not read sci-fi but we were willing to give this book a chance because they had read other Atwood’s works. That is, until they saw the android wearing what looks like a futuristic clothes hanger as a headpiece and an egg container as a bra. You either love her or hate her, I am of the adoring-type…http://girlsguidetoscifi.blogspot.ca/2013/11/for-gregs-pop.html. And would vote her for mayor…right about now I would vote for a garbage can for mayor….sorry slipping into Rob Ford despair. I had the same issue with the essay and fiction mixture! I didn’t want to fiction in there, though I loved the essays. I LOVE the picture of “is this sf” being the freebird of your book club. LOVE IT. So I also had beef with Margaret Atwood, but in my case there was absolutely no reason at all. I just made it up. Unless I repressed something horrible. But basically at some point I deceded that I really didn’t like her work and just felt all ick whenever I heard about her. And then I read The Year of the Flood and was like, I HAVE BEEN A FOOL. And when I read Handmaid’s Tale I realized what level of fool I had been for making up beef with her. Though I agree that her whole “I don’t write sf” thing just feels ridiculous. But hey, whatever Maggie, I guess I’ll just have to get over it. I just found your blog five minutes ago and I am totally in love. Thanks so much for writing what you write. Looking forward to reading more. My beef with Atwood was entirely made up and silly too. Her writing is quite brilliant. Thankfully, since I have avoided her for years, I now have quite a few books to read, since she is rather prolific.